In the tiny town of Titan Falls, New Hampshire, the paper mill dictates a quiet, steady rhythm of life. But one day a tragic bus accident sets two families on a course toward destruction, irrevocably altering the lives of everyone in their wake. June McAllister is the wife of the local mill owner and undisputed first lady in town. But the Snow family, a group of itinerant ne'er-do-wells who live on a decrepit and cursed property, have brought her--and the town--nothing but grief. June will do anything to cover up a dark secret she discovers after the crash, one that threatens to upend her picture-perfect life, even if it means driving the Snow family out of town. But she has never gone up against a force as fierce as the young Mercy Snow. Mercy is determined to protect her rebellious brother, whom the town blames for the accident, despite his innocence. And she has a secret of her own. When an old skeleton is discovered not far from the crash, it beckons Mercy to solve a mystery buried deep within the town's past. Mercy Snow by Tiffany Baker is very highly recommended. Titan Falls, New Hampshire is home to the Titan Paper Mill on the banks of the Androscoggin River. The McAllister family owns the mill and most would say that they also own the town. The current McAllister's are Cal, his wife June, and their son Nate. Even though June is not from the area, Cal met her at college, she is the ruling grand dame of the town and, as a McAllister, she controls, or tries to control, the thoughts and actions of the citizens, most of whom are beholden to her husband for a job. The one exception to this has been the various members of the Snow family who have lived on a plot of land by the river for years. When a school bus accident claims a victim and puts the bus driver in the hospital the coincidence of Zeke Snow's truck found crashed into a tree further down the road makes it clear to most that Zeke is likely the guilty party who forced the bus off the road, causing the fatal accident. Mercy and Hannah Snow, Zeke's sisters know he is innocent but it is nearly impossible to win the war of words and accusations that June has undertaken in the community. Zeke goes into hiding and his sister Mercy undertakes the nearly impossible task of clearing his name. But June has her own reasons to make sure Zeke is blamed for the accident. Baker does an excellent job developing her characters. She describes them along with land and weather in Titan Falls with such a deft hand that they all, as well as the river, become characters in this giant-killing tale. 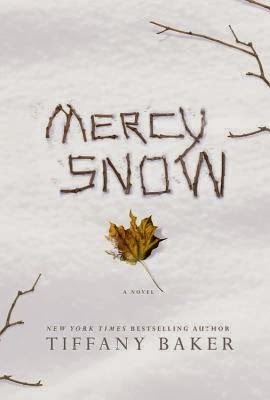 For me Mercy Snow clearly shares more than a passing resemblance to a modern day folktale, with elements of a morality play. The basis for the story is a universal good versus evil, the little guy versus the big guy, with the down trodden Snows who have a mystical tie with the land are struggling to be treated fairly by the town controlled by the evil pollution-mongering McAllisters. It is also a novel of secrets. There are old secrets and new ones connecting everyone and not all of the secrets are known until the end. While Baker's writing elevated Mercy Snow above the ordinary, I did keep thinking that this story has been told before, which detracted from my overall enjoyment. I'll also freely admit that the ending raised my original idea of what rating I would end up giving to Mercy Snow. Even though we know right from the start who caused the bus accident, there are a few other surprises awaiting patient readers. Disclosure: My Kindle edition was courtesy of Grand Central Publishing via Netgalley for review purposes.